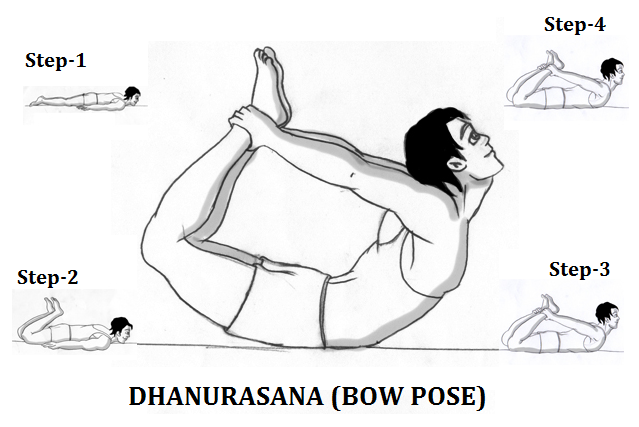 Dhanurasana is known as bow asana as when it is done the shape of the body takes bow shape. Dhanurasana is derived from the Sanskrit word 'Dhanu' means 'bow' and 'asana' means posture. Lie on the ground on stomach and arms by the side of your body. Keep legs apart. Lift or bend the legs till knees. Take your hands behind and hold the legs in the ankles. Breathe normally. Lift your chest from the ground and pull your legs up till you are comfortable. The shape of your body should resemble a bow now. While breathing normally hold the position till you are comfortable. After 30 seconds get back to normal position and relax. This asana helps in curing constipation and helps in reducing in belly fat. Helps in overcoming lethargy and laziness in our body. Massage thyroid and adrenal glands. Stretches the whole body. Helps in toning legs and arms muscles. Very helpful for women. It provides relief from mensuration problems. People with high or low blood pressure, back pain, hernia, head ache and any abdominal surgery should avoid doing this asana. Pregnant ladies should avoid doing this asana as it stretches abdomen. Better to do any asana with the help of an expert guide. Bend as much as you can. Do not stress yourself that can cause injury in spine or any part of your body.